If reorienting the faceplate doesn't correct the issue, you can also try opening the vent a bit more. 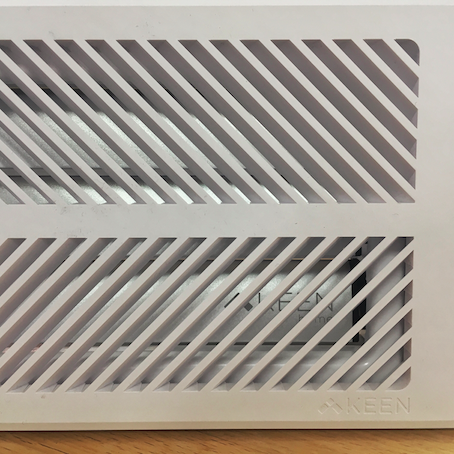 If you have it at 0, you can open it to about 15-20%, or even 30%, and still get a comparable airflow-redistribution effect while cutting down on the whistling noise. If you hear rattling, this is typically the result of the airflow causing the plastic vein to collide with the metal louver. To correct this, you can apply some electrical tape along the plastic veins that run between each of the vent's louvres. In the 6" vent model, you can even just try bending the plastic vein away/off the vent, as they don't serve much of a structural purpose. This should eliminate any residual noise coming from the vent.